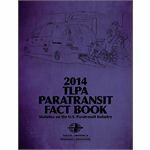 The 2014 Paratransit Fact Book includes 23 tables and charts. The survey information collected from the respondents is supplemented with aggregate contracting information from the National Transit Database. The Fact Book includes information on operating costs per mile, operating costs per hour, a summary of total fleet contracting, summaries of sedan and accessible van contracting, wages, salaries and benefits, paratransit scheduling software, regulatory controls, paratransit business practices and insurance coverage and costs.